Without skipping a beat, I said “Of course I’m coming home! !” and made sure I was on time for dinner at 8pm. This bowl was no exception. Brimming with “liu”, the eggy brown gravy was slightly gluey and flavourful. The handmade noodles were firm and chewy, while the dried cuttlefish gave the soup a slightly pungent aroma. I love bamboo shoots, specially the crunchy ones – and my bowl was full of it. I ate the noodles with Kg Koh chili sauce, wishing I had some pickled garlic to go with it. Even so, it was still good! Heat some oil in the wok and fry belly pork till browned. Add in cuttlefish, and fry till fragrant. Dish out. Fry garlic and ginger, then add in belly pork, squid, bamboo shoots, cabbage, snow flower and Kam Cham. Pour in ikan bilis soup and boil till cabbage becomes soft. Thicken soup with corn and tapioca flour mixture. 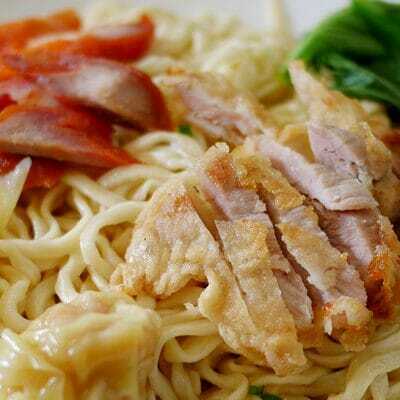 Serve with handmade noodles (similar to pan mee noodles, but finer) and enjoy! Wow, looks really delicious..plan to open a restaurant in the future? OMG! I need to invite myself to your house for this! Is it vinegarish? Where did I get the idea that it was vinegarish? The Loh Mee looks charming, esp the abundant sauce…so blissful! Haven’t tried those with bamboo shoots, but I imagine it’s nice and crunchy. Do hock chews eat it with vinegar? 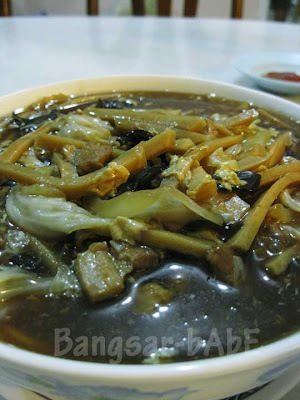 Loh Mee with bamboo shoot-best. Leo – Yes, the pickled garlic I mentioned is actually garlic in vinegar. So it’s really shiok! 550ml – Haha…the loh mee is not vinegar-ish, but the garlic is! Selba – It’s quite different from other loh mees too. Wow, when I saw the pictures, I thought for sure you were at some restaurant. I can’t believe your mom made that! Yes, recipe please! wow, arent u lucky, to have a chef at home!!!! it looks soooo goood…noodles from kg koh as in sitiawan’s kg koh? u have a courier service plying the route? Such a wonderful mum you have ! Giving you the best of da best, everytime ! U wanna any “asli” Cameron Highlands bamboo shoots ? taufulou – Hahaha…go make some milo! FBB – Yup, noodles from Sitiawan Kg Koh. The lady makes them fresh (must call to order) so we usually buy 5-10kgs at one go! 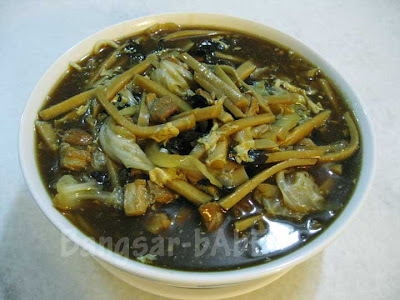 I love the look of that dark broth, and I’d never think of combining pork, cuttlefish, bamboo shoots, and black fungus. It sounds great! Lucky you have a mom who’s such a great cook! Oh, and btw, what is “shiok”? makes me drool …New Road loo mien !! 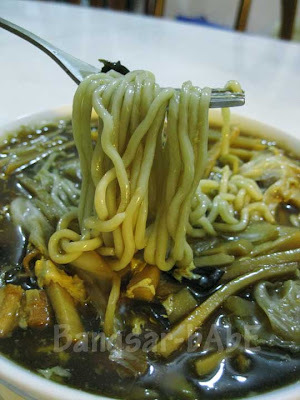 yum yum…even better, kampua with loo mien gravy…..i need to make a trip back soon. Some dark soy sauce is used to make it dark brown.